What stuck with me was the first response: “I think we’ve really learned that when faced with adversity, we fall apart.” I went home feeling impressed with the self-reflection. But fast forward a few years and what I’ve realized is that until very recently, nobody, not even the person who made the initial comment, has expressed the desire or the need to build resiliency. It has seemed odd to me that such a profound observation was not followed up or acted upon. This fall through an exercise at parish council about the life cycle of organizations, I now hunch that the experience of falling apart in the face of adversity has to do with this parish having enjoyed a high level of stability for a very long time. We were born as a community 60 years ago, so the initial period of formation came in the early 1960’s. For organizations to prosper long term, beyond their first generation, there is a need to revisit formational questions of identity, boundaries and purpose. I’ve asked about experiences of such a process and it seems as though there has never been significant or meaningful re-formation here at St. Andrew’s. That means that undergirding our life together remains an identity, boundaries and purpose formed in 1960’s Anglicanism. It’s impressive to have held on to that for 60 years and shows a kind of resiliency. But it’s a resiliency that’s about holding on to the past more than engaging with the present, or embracing the future. Given that, it is no wonder that at least one parishioner experienced the response to adversity brought on by the 21st century as falling apart. A different kind of resiliency is needed. On this First Sunday of Advent, we hear about resiliency from Jesus in our Gospel passage. It’s from the Gospel of Luke, on which we focus in this Year “C” of our 3-year lectionary beginning today. We begin near the end of the Gospel, with Jesus talking about the end. Earlier in chapter 21, Jesus predicted that the temple would be torn down and the crowd questioned Jesus about when and “what will be the sign…” this is to occur. Jesus goes on to talk about all manner of terrible things that will happen. Today we hear the conclusion of Jesus’ speech, marking the end of His ministry in Jerusalem and His teaching in the temple. “There will be signs in the sun, the moon, and the stars,” Jesus declares, “and on the earth distress among nations confused by the roaring of the sea and waves. People will faint from fear and foreboding of what is coming upon the world, for the powers of the heavens will be shaken.” Confusion, fear and foreboding… these are the primary reactions Jesus anticipates for those who see signs that profound change is coming to their world. Perhaps we can take heart in knowing that fear of the future is not new. The people of God… indeed, all manner of people, have regularly faced such adversity. Feeling fear and confusion in the face of it is common and expected. Beyond these emotional reactions, however, what matters is what we do, how we respond. Jesus goes on: “Then they will see ‘the Son of Man coming in a cloud’ with power and great glory.” In other words, adversity is a precursor to God’s coming. When we feel fear and confusion at what the future might bring, we are to remember we are people of God, and watch for God’s coming. The old adage “it’s always darkest before the dawn” might be cliche, but cliches become so for a reason. Many mystics and other spiritual giants write about this phenomenon. The book we read this fall by Richard Rohr starts with the premise that flourishing later in life begins when our current ways fall apart. In the 16th century, St. John of the Cross coined the phrase “tbe dark night of the soul,” and his contemporary St. Teresa of Avila described something similar in her masterpiece mystical work The Interior Castle. There she describes the place just before full unity, full communion, with God as the most difficult, the most dark. Watching and waiting for God through the darkness is not, Jesus goes on to tell us, passive. We have a role to play and our posture matters. Jesus continues: “Now when these things begin to take place, stand up and raise your heads, because your redemption is drawing near.” In the face of fear and foreboding, we are not to shrink back or curl into ourselves. We aren’t to disappear into denial, plunging our heads in the sand. We aren’t to throw up our arms, claiming powerlessness or victimization. No. Today Jesus commands: Stand up and raise your head. How else will we be able to see our redemption drawing near? Today you will receive your stewardship package. In it, you will read about some of the great things we have to celebrate as a parish this year. You will also read about some adversity in the current state of our finances. It is not unusual to have a deficit at this time of year, but our current deficit is larger than it has been in the past several years. If we end the year with a deficit, we have savings from past surpluses to carry us through. So there is no need to panic or to fall apart. There is also no need to fall apart about what will likely be a deficit budget coming for 2019. There is, rather, a need to stand up and raise our heads. We might feel distress and confusion about what is coming upon our community. It might be tempting to faint with fear and foreboding, but it will not do any good. In the face of this adversity, it is time to find a different way than falling apart. It is time to stand up and raise our heads. It is time to build our resiliency and our sustainability to step into whatever the future may hold. It is time to watch for our redemption drawing near. 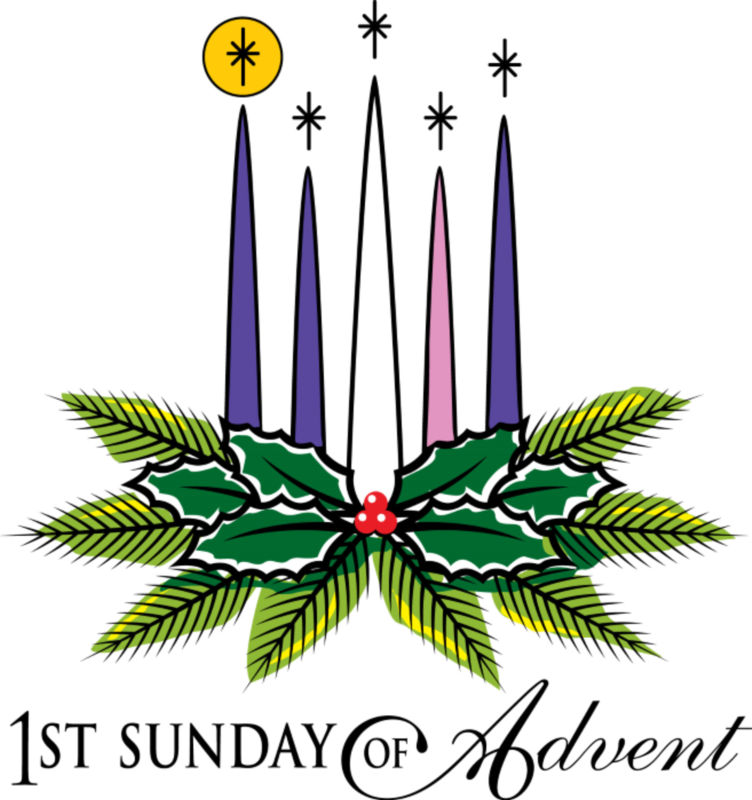 This First Sunday of Advent is a day for hope, and it is my sincere hope that we will together find our way in developing greater organizational strength and resiliency. I hope to help you build it into the organizational fabric of St. Andrew’s, and maybe even into individual lives. I hope you will participate in conversations about our life together, to discuss the critical issues and most exciting opportunities that we face. I hope that the year of “no” that I have just experienced has ended and I hope that we will find our collective “yes” to current reality and possibilities. I hope we can discover a deep “yes,” not just as a short-lived emotional impulse, but a thoughtful expression of a deep “yes” for the long haul. One concrete way I’m encouraging you to express your hope this Advent is by participating in a creative process towards a new set of church paraments. “Parament” is the name for the coloured fabric art that enhances our liturgical space and expresses the changing church seasons. The purple we have today has been the traditional colour for Advent, but in the past 20-odd years there has been a movement towards blue as the colour for Advent. Blue is understood as a colour better representing the hope and hopeful expectation of Advent. Blue for Advent also helps distinguish it from the more sombre and penitential season of Lent. There is also an interesting symbolic connection to the idea of deepening darkness as the precursor to a new dawn. Before the sun rises each day, the sky is a deep blue and while we may still be sleeping at that hour, it is the deep, dark blue that heralds the dawn. And so… blue for Advent. Our part in creating a set of blue paraments is to write out… handwrite… our favourite prayers, psalms, hymns from Advent. They might be specific to the season or perhaps words that we say throughout the year. Early in 2019, our handwritten prayers will be sent to the liturgical fabric artist we’ve contracted, Thomas, who will silkscreen them onto silk and then make the items we need. There will be a year in between. We won’t see them until next Advent and so our participation this year gives us an opportunity to practice our hope for our parish, for the long term. It is one symbolic, spiritual exercise of hope… hope for whatever tomorrow, whatever the coming year and the years beyond, might bring. Hope for a new sustainability and greater resiliency for this church family. Hope that when “these things begin to take place,” our response will be to “stand up and raise our heads,” so we can see our redemption, God’s own heart, drawing near.